Makita continues to develop their 12V Max line of cordless tools with three new products, including the Makita 12V Max CXT Jig Saw. The new jig saw (model VJ04R1/Z) delivers 0-2,900 strokes per minute and a trio of orbital settings along with straight cutting capabilities to cover a variety of cutting applications. The jig saw also features a die-cast aluminum base that adjusts from 0 degrees to 45 degrees right to left. At 9-1/8 inches long and 3.8 pounds, the Makita 12V Max CXT Jig Saw is compact and of course, features Makita’s ergonomic design. The Makita 12V Max CXT Jig Saw takes advantage of a lock on switch to help keep fatigue down during longer operations. 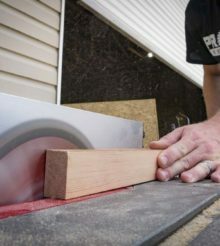 An electric brake stops the blade quickly when you’re done with the cut or need to inspect your work before continuing. You’ll need “T” tang style blades to go with this model. An integrated dust blower clears a path while the rear of the tool features a dust port for connection to your dust extractor. The 12V jig saw is available as a bare tool (VJ04Z) or as a kit (VJ04R1). The kit includes 2 Makita 12V Max CXT lithium-ion 2.0 AH batteries, a 12V Max CXT lithium-ion charger, jig saw blade, and tool case. Keeping in line with the new 18V LXT packs, the 12V Max CXT packs feature an integrated LED battery charge level indicator. The new Makita 12V Max CXT Lithium-Ion 3-3/8 Inch Tile/Glass Saw feeatures a compact design that’s engineered for ease-of-use and maneuverability. The 12V saw (Model CC02R1) weighs just 4.2 pounds with a 2.0 amp hour battery installed. No load speed runs up to 1,600 RPM with a 1 inch cutting capacity and 16.9 ounce water supply tank for wet cutting applications. The kit includes the saw, 3-3/8″ diamond blade (tile/glass), two 12V Max CXT 2.0 amp hour batteries, charger, and tool case. The Makita 12V Max CXT Lithium-Ion L.E.D. Flashlight is designed to be an ultra-compact light source. LED light sources are known for their long life and efficient run time. Makita’s newest solution is no exception with up to 28 hours per charge using the 4.0 amp hour battery (sold separately). The ML103 is 3-7/16 inches long and weighs a mere 0.6 pounds when using a 2.0 amp hour battery (sold separately). The compact size makes an attractive option in tight and confined spaces. Shop all Makita cordless power tools at Acme Tools!